Jude recently began working with the Phonics and Reading with McGuffey. 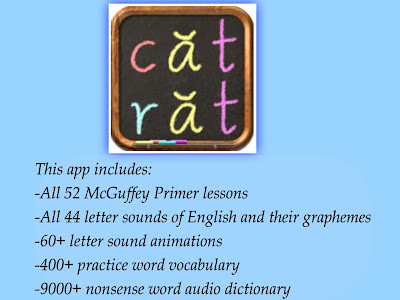 This LiteracySoft program is available from the iTunes App Store, it is usable across the iPhone, iPod Touch, and iPad platforms. (There are also Android, MAC and PC-compatible versions available, but we used only the Apple version.) Jude mainly used this program on his iPad, because the screen on my iPhone was too small. (Once downloaded, apps can be used across all devices linked to that iTunes account; we have ours linked so that favorite apps can be used by everyone without having to repurchase.) An older student with better fine motor and/or concentration/focus skills might have an easier time with the more crowded smaller screen; Celia (almost 9) tested the program out for this and found it was fine on the smaller device. It does not require the internet for use, so once it has been downloaded, you can use it anywhere regardless of device. This app retails for $19.95. There is also a free "Lite" version of the app (also available via iTunes App Store). It only contains the first 10 lessons, so it is not as extensive a program, but would be a good trial to see if this program works for your student. 4 1/2-year-old in skill level. Though his "adjusted" age still fits in the recommended age bracket, he definitely struggled with this program. 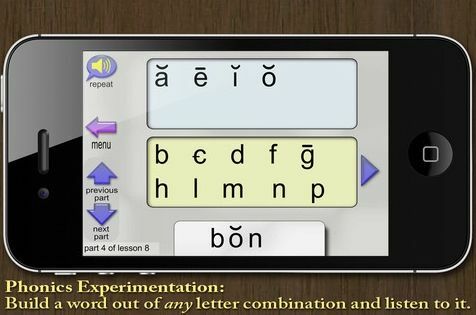 One reason was because the program uses stylized letters, not regular letters, to indicate sounds. Using visually different graphemes might work for an older/ESOL student, who can more easily adapt between types and remember the differences. However, Jude is still trying to connect visual letters with their sounds. When the visual kept changing, he would lose track of the sound. The Phonics Blending activity (Part 4 of each lesson) shows a list of vowel and consonant graphemes, and wants the student to arrange the letters in a consonant-vowel-consonant (CVC) pattern word. In theory, this is a great idea - one can hear how any combination of letters will sound together. However, there are no words to copy -- it is up to the student to just put together the sounds. I think this would be better if there was a section with sample words provided, with the student being asked to put the sounds together to form a particular word. Jude was randomly putting sounds together, many of which were not words. He wasn't really able to make the sounds-make-words connection. We are currently using ABeCeDarian as our main Reading/Phonics program, and I had hoped to be able to use this along side for "on the go" practice. Unfortunately, that idea didn't work so well. I would recommend it for a student who has a good base of sounds/phonics, because the sounds presented don't seem to have any "order." (I'm sure there is a valid reason behind the arrangement of sounds, since McGuffey Readers have been around for nearly 200 years, but the sounds are not arranged in tandem with any program I am familiar with.) Most programs use CVC patterns to start and work their way through short vowels to long vowels, blends, etc. While the Blending activity in each lesson asks the student to arrange letters in a CVC pattern, Lesson 1 starts with both short and long A. Lesson 2 introduces the hard [z] sound (IPA /ʒ /) for the letter s, plus the word [the], incorporating the blend [th] (IPA /ð/) and quasi-silent e. Not only was this confusing because Jude is still putting sounds with letters, but the word "the" didn't fit the phonics "sound it out" pattern he is becoming used to. The program is not really enough to use alone, but it didn't dovetail with our current curriculum. Jumping from the Menu was a better option, because we could skip over activities that didn't work for us so well (like the blender). It also showed the sentences/story in a single-page form. After practicing the sentences in the lessons, it helped make the connection that sounds combine to words, words combine to sentences, and then sentences into a story. We used this program almost daily, but Jude has not gotten very proficient. On one hand, the words did not match the "sound out" patterns that he has been working on. He eventually became "proficient" with the words because he did the program so frequently that he memorized the pattern. Everything repeats in the same order, no matter how many times you do it, so he just eventually would know "what comes next," and anticipated the answers, even though he did not recognize those words outside of the program. I would consider giving it another try, once he is more of an "emergent reader" rather than a brand-new decoder. Lots of Crew members have been practicing their reading with this program. Click the banner to see what they thought of Phonics and Reading with McGuffey.